The 12-inch MacBook Air has been rumored ad nauseam over the past year or so, with Apple enthusiasts certain that the slick notebook will follow the lead of its more powerful cousin by incorporating a Retina display. Today, new details have emerged that paint a more vivid picture of what we can expect from the product’s apparent announcement around the time of WWDC, as well as some very interesting mockups. Hitherto, we’ve only had tidbits and scraps to feed on as far as the Retina MacBook is concerned, but the folks at 9to5Mac have unearthed a number of details from what they claim to be a reliable internal source. When the MacBook Pro was treated to a super-sharp display back in 2012, it did away with quite a few long-standing hardware features, notably the optical drive. 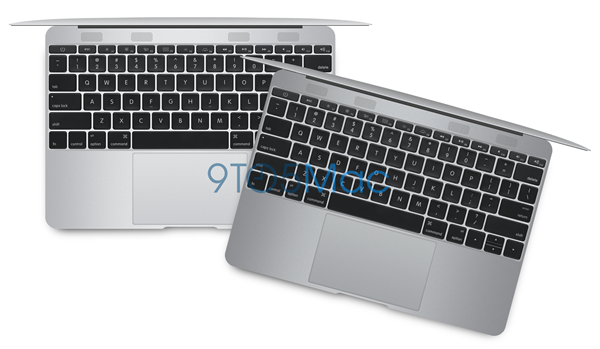 The purpose of lightening the load was to ensure a slender form factor, and according to 9to5Mac’s report, the 12-inch MacBook Air will also be making sacrifices in favor of appearance and profile. The sources of the report are close enough to the action to have tested prototypes of the machine firsthand, and as such, we now have a strong idea as to what’s next as far as Apple’s notebook endeavors are concerned. The general downsizing of the body is only the beginning of how Apple intends to shave vital millimeters off the Retina MacBook Air, though. The keys on the keyboard will be moved slightly closer together a scarcely noticeable amount, and should have no effect on the typing experience, while the iPhone maker will also be considerably reducing the number of ports in order to save space. The edge-to-edge keyboard will also omit a number of function keys, which will not only reserve space but simplify the keyboard in general, and will sit above a revised trackpad that will, it is claimed, no longer click. Internally, Apple is dubbing it the "MacBook Stealth," and if you were wondering whether Apple could make its prized notebook any thinner, these new details answer that question in quite damning fashion. The worst thing about the original MBA was the lack of ports. Apple finally woke up and the current MBA has a decent io. Why would they go and mess with a good balance which they have finally struck. So I have to buy more hubs and adapters to fill up my bag and lighten my wallet. I also dislike the edge to edge keyboard proposal. Straight wrist typing really takes it toll and with no sides on the keyboard you are forced into this position. Are apple so desperate to keep their marketing going on thinner each year. I like my current MBA but a smaller version seems like it’s just getting too small. Form over function? question Apple’s motives… as a consumer, I don’t feel too cared for. spam much? youre all over the internet ADVERTISING that site! Ive found you on apple forums posting it too! Anyone here can google is detoxmymac is safe and sure enough your name pops up in threads. detoxmymac does not work, no one wast their time or money on it. and Casey, dont load up these articles with your spam any more. Excuse me? You must have me mistaken with somebody else, Travis. I would appreciate it if you spoke to a lady with a bit more respect going forward. Nope, the 22 comments you have here all have to do with that site too… “lady” I think it’s silly how you being a “lady” protects you from being called out for spamming these threads. Don’t be sexist, this has nothing to do with gender. You spammed all these threads, regardless of gender, and I reported every single one of them.. Have a nice day. What is with the false accusations and claims of sexism? Travis, let me ask you a question – do you have children? Done with this conversation.. You’re not going to get personal with me. If you’re going to make a fake profile, at least try to make it slightly less obvious!